An MSW class in session. The College's Master of Social Work program has received accreditation from the Council on Social Work Education, a confirmation of its high academic standards. "For local human service programs, accreditation ensures the professional preparation of the area workforce," said Lee Gustafson, chair of the St. Scholastica social work department and MSW program director. "Employers can be assured of the quality of St. Scholastica's MSW graduates." CSWE accreditation ensures that the program's graduates will remain highly employable and sought after by employers in the future, Gustafson said. St. Scholastica's rigorous clinical specialization prepares graduates to become Licensed Independent Clinical Social Workers. The LICSW is the "gold standard" for human service degrees, Gustafson said. In addition, the state of Minnesota requires that social workers graduate from a CSWE-accredited program. 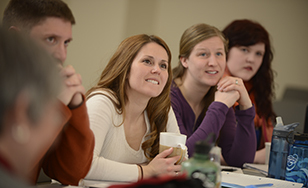 St. Scholastica's MSW program, which launched in 2013, focuses on advanced clinical practice, including assessment and diagnosis, evidence-based intervention and treatment, group dynamics, and social policy and social justice issues. The program has been "retroactively" accredited from 2013 through June 2020, assuring that all alumni are now acknowledged as having graduated from an accredited program. The program is helping to fill a growing demand for social workers across the state. Duluth, the North Shore and much of Minnesota outside the Twin Cities have been designated as Health Professional Shortage Areas by the U.S. Department of Health and Human Services. The Department of Labor projects an expected growth rate of 20 to 27 percent for clinical social workers in Minnesota over the next ten years. The CSWE is accredited by the Council for Higher Education Accreditation. This creates programmatic quality standards, eases credit transfers between schools, and provides access to federal and state funding, including veteran's programs.